Oil Eating Microbes remove organic waste quickly leaving clean healthy water without toxic waste. Recommended for Swimming Pools up to 120,000 litres. In the skimmer box, the block will treat up to 120,000 litres of water for 6 months. For smaller pools the block can be broken in half for up to a 60,000 litre pool for 6 months. How to use Place the block in your skimmer box so it has the maximum amount of water flowing over it. Key features Can be used in fresh or salt water. Is 100 Natural and environmentally friendly. Reduces water changes, reduces filter cleaning, reduces chemical use (up to 80) keeps water cleaner and healthier. 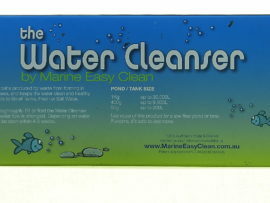 Removes organic waste so there are no nutrients for algae to feed on.